Join Doug & Kevin as they cover Doctor Who episodes right from their early beginnings in 1963, from the perspective of two "n00bs" who have never seen the series! 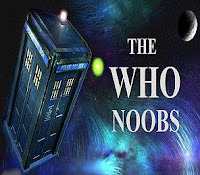 The Who Noobs want to wish all fans a happy 48th anniversary today! Unfortunately, it's been a slow year for our podcast, excuses, excuses, excuses, blah, blah, blah. The project is still in our hearts and hopefully we can get some new episodes up for you guys in the near future. Many many thanks for your patience with us! These aren't the Daleks you're looking for. Marco Polo, Episode 7: "Assassin At Peking"
Marco Polo, Episode 6: "Mighty Kublai Khan"
Hi everyone! I'd just like to respond to the feedback we've been receiving lately, basically people clamouring for a well-deserved update! This is awesome... it lets us know that people out there are still interested in what Doug and I have created so far. I can't wait to get back to the trusty Doctor and his gang. To quote a poster: the Keys of Marinus await! Merry Christmas, everyone! We are joined this week by Darcy and Holly to discuss the evil intents of Acomat. Written by John Lucarotti. Directed by Waris Hussein. Original air date: March 21, 1964. Audio length: 78 mins 9 secs. Kevin and I want to wish all you fans out there, noobs and old-timers alike, a happy 47th birthday today! We've still got a heck of a long way to go on our journey, but we're confident it'll be an exciting one, and hope you all stick with us. Tegana is up to more mischief this week while Marco Polo has a change of character. Also, Barbara's fate is revealed. Originally aired March 14, 1964. Directed by John Crockett. Written by John Lucarotti. Audio length: 59 mins 51 secs. This week we look at the Doctor Who episode called "Five Hundred Eyes", or in some circles, "The Cave of Five Hundred Eyes". Barbara secretly follows the warlord Tegana to the titular cave, which serves as a hideout for Nogai's minions. Terrible developments unfold! Originally aired March 7, 1964. Written by John Lucarotti. Directed by Waris Hussein. Audio length: 62 mins 15 secs. Hi everyone. Just thought I'd jump in to tell you that Episode 16 will be delayed due solely to my schedule of shifted priorities this week. Apologies to the fans, and to Doug, for keeping everyone waiting! We still want to get back on track with regular Twhosday updates sometime in the near future, but please bear with us the next couple months in the meantime. Two extremely special guests join us this week (for the first time!) to discuss the 2nd episode in the "Marco Polo" saga, "The Singing Sands". Tune in to find out the relation. This is our longest (and hopefully most engaging) podcast yet! Episode starring Mark Eden as Marco Polo and William Hartnell as Doctor Who, originally aired February 29, 1964 (a leap day). Audio length: 74 mins 46 secs. THE MISSING EPISODES ARE HERE!!! In Marco Polo, Part 1, Doug and Kevin take a look at (or is that a listen to?) the various audio and video reconstructions that exist for this first "lost" episode of Doctor Who. (So for those of you who have inquired, yes, we are covering them!) Tune in to hear what we have to say. Originally aired February 22, 1964 and directed by Waris Hussein. Starring William Hartnell as Doctor Who and Mark Eden as Marco Polo. Audio length: 64 mins 27 secs. [Ed note: Our ship malfunctioned this week, much like the TARDIS, so we're a little late with the new episode. But don't despair, we'll soon be back on track! Thanks for the eager anticipation!] In "The Brink of Disaster", strange things continue to happen aboard the TARDIS until an unlikely candidate realizes what the problem is. Kevin dubs this episode "The Four Seasons" and explains what that's all about throughout the podcast. Starring William Hartnell as Doctor Who, written by David Whitaker, directed by Frank Cox. Originally aired February 15, 1964. Audio length: 61 mins 46 secs. Following their harrowing escape from the Daleks, the four time-and-space travellers are rocked by a sudden explosion to their ship, the TARDIS, and then strange events start to occur. It's an interesting departure from what we've seen in previous episodes thus far. Doug and Kevin seem to have different takes on the episode this week. Also, Doug drops a Salvador Dali reference and Kevin is totally clueless! Originally aired February 8, 1964. Directed by Richard Martin, written by David Whitaker. Audio length: 61 mins 49 secs. Feeling bored today? It's Who Noobs to the rescue! That's right, this week we are covering Episode 11 of Doctor Who, which happens to be called "The Rescue"! This is the story where the Doctor and Susan are captured by the Daleks, and Barbara and Ian come to the rescue! With a super-special appearance by Johnny Cash. What am I talking about, you say? Well... tune in to find out! Originally aired February 1, 1964, directed by Richard Martin. Audio length: 53 mins 14 secs. Ian, Ganatus, and Barbara journey through the mountains of Skaro, much to the behest of Antodus. Meanwhile, the Doctor and Susan vandalize sensitive equipment, and pay dearly for their crimes. Originally aired January 25, 1964. Written by Terry Nation and directed by Richard Martin. Audio length: 37 mins 35 secs. This week, Ganatus takes Barbara on a date through the murky swamps of Skaro. Originally aired January 18, 1964. Starring William Hartnell as the Doctor, directed by Christopher Barry. Audio length: 46 mins 16 secs. We're back this week with Episode 8: The Ambush! Just what is that young man, Ian Chesterton, up to this week? Hmm? Tune in to find out! Originally aired January 11, 1964. Written by Terry Nation and directed by Christopher Barry. Audio length: 52 mins 23 seconds. Can Barbara, Ian, Susan, and the Doctor escape from the evil clutches of the Daleks? And, who are these mysterious "Thal" creatures? Find out by listening! Written by Terry Nation, directed by Richard Martin, starring William Hartnell as the Doctor. Originally aired January 4, 1964. Audio length: 61 mins 53 secs. We're back this week with the second episode in "The Daleks" serial, entitled "The Survivors". This is the sixth episode in total so far, and originally aired December 28, 1963. Starring William Hartnell as Doctor Who, written by Terry Nation, directed by Christopher Barry. In this week's episode, Doctor Who, Ian, and Susan go looking for the missing Barbara in the strange "dead" city. Before they can reconvene with Barbara, however, they run into an unforeseen, terrible adversary.... Audio length: 55 mins 39 secs. The TARDIS warps to a new planet which appears to be "dead", but as Susan soon discovers, it doesn't quite seem the case! Written by Terry Nation, directed by Christopher Barry, starring William Hartnell as The Doctor. Originally aired December 21, 1963. This may be our best podcast yet! Audio length: 50 mins 30 secs. The finale to "An Unearthly Child", originally aired December 14, 1963. Written by Anthony Coburn, directed by Waris Hussein, starring William Hartnell as Dr. Who. Audio length: 41 min 22 secs. This week the TARDIS crew members travel through "The Forest of Fear", in Episode 3 of Doctor Who. Original airdate: December 7, 1963. Starring William Hartnell as The Doctor. Audio length: 48 mins 31 secs. Doctor 'Twhosday' has arrived! This week we cover the second classic Doctor Who episode, entitled "The Cave of Skulls". The Doctor, Susan, Ian, and Barbara travel back to prehistoric times and find themselves encumbered by a "fiery" situation! "The Cave of Skulls" was written by Anthony Coburn, directed by Waris Hussein, and originally aired November 30, 1963 on BBC. This week, Doug provides the episode recap while Kevin adds commentary. Audio length: 35 min 01 sec. Our very first podcast is now alive! We cover the debut episode, "An Unearthly Child". Starring William Hartnell as Doctor Who, written by Anthony Coburn, directed by Waris Hussein. Originally aired November 23, 1963. Audio length: 47 min 09 sec.